When I think about St. Patrick’s Day, the first thing I think about is the shamrock. Sure, there are other symbols of the holiday, like leprechauns, gold coins, rainbows, and getting pinched, but the bright green shamrock is my favorite. 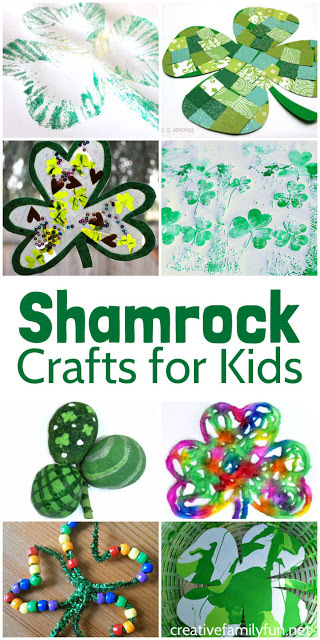 So, I went out and searched for some of the best shamrock crafts for kids. I found a treasure trove of great ideas. Check them out! Pick out a few of these awesome crafts and grab the craft supplies so you can spend an afternoon crafting for St. Patrick’s Day. It’s a great way to spend time with the kids and you’ll have some great shamrock decorations to display. Grab your rolling pin and transform it into an art tool with this fun Rolling Pin Shamrock Prints project from No Time for Flashcards. Give your fine motor skills a workout with this Crepe Paper Shamrock craft from The Resourceful Mama. These Beaded Shamrocks from Fun-A-Day are also a great fine motor craft. Play with rhythm and add some paint to create these unique Shamrock cards for kids from Twitchetts. Make painted Sham-Rocks with this fun nature craft from The Pinterested Parent. Try a fun painting technique to make these Shamrock Smoosh Paintings. Make a fun t-shirt to wear with this Polka Dot Shamrock T-Shirt tutorial from U-Create. Use up your scrap paper to make these Mosaic Shamrocks from Happiness is Homemade. Experiment with bleeding tissue paper to make these Bleeding Tissue Paper Shamrocks at The Pinterested Parent. Decorate your windows with these Shamrock Sun Catchers from Pink Stripey Socks. Turn a coffee filter in to a shamrock with this Coffee Filter Shamrock craft from Housing a Forest. Watercolor and salt combine together to form these Rainbow Watercolor Raised Salt Painted Shamrocks from Rhythms of Play. Add a rainbow to make these pretty Shamrock Rainbows. Or you can turn your rainbows into these pretty Rainbow Three-Leaf Clovers from Crafty Morning. Try a watercolor resist technique to make these beautiful Watercolor Positive and Negative Shamrocks at SparklingBuds. Get out the glitter to make these pretty Glitter Shamrocks from Twitchetts. Make an awesome banner to use year after year with this Shamrock Garland at Cutting Tiny Bites. Create a fun snack and make these Shamrock Pretzel Pops from Mommy’s Bundle. 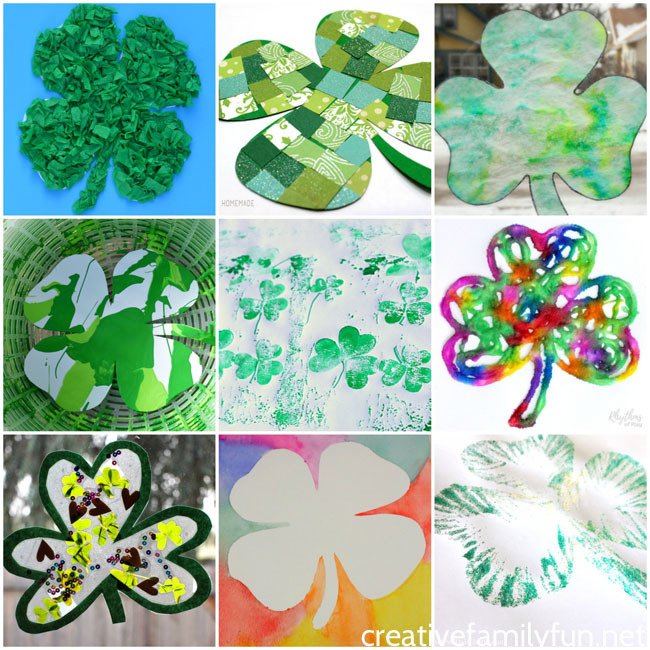 Which one of these shamrock crafts are you going to try first? I can’t decide. They’re all so awesome!